In 1933, H.D. Cowden operating as the Alaska Gold Dredging Corporation, who had managed a mining operation on upper Walkers Fork, had Washington Iron Works in Seattle build a 3-foot dredge to be installed on the South Fork of the Fortymile. A camp was built ½ mile below the mouth of Lost Chicken Creek to facilitate the operations. The shipping of the dredge was delayed due to a labor strike but was finally shipped from Skagway to Whitehorse on the White Pass & Yukon railroad, from Whitehorse to the mouth of the Fortymile River by steamboat, and then during the winter of 1934-5, by Caterpillar tractors up the Fortymile River and South Fork to a point about 0.9 mile below the mouth of Lost Chicken Creek. The dredge initially burned coal obtained in the area around Chicken. It was soon converted to burn wood, however, due to the poor quality of the coal - not enough steam could be produced to power the dredge efficiently. The dredge had 64 buckets, each with a capacity of only 0.14 cubic yards, and it burned about 7 cords of wood per day. Thirteen men were required to operate the dredge, working in 3 shifts of 8 hours each. In its first operational year of 1935, Cowden’s dredge (or the Lost Chicken dredge) mined around $40,000 in 24 days. At the time, Washington Iron Works dredges were yet untested in the field, so the dredge had its problems including machinery that not work cohesively and a week hull. Even so, the dredge did produce $76,000 in 1936 and $50,000 during its final season when Cowden’s company found itself with labor liens of $10,000 filed against the dredge by unpaid employees and back taxes of $15,000. That winter, the dredge was acquired by Northern Commercial Co who shut it down and the following year, the dredge and ground was optioned to Fairbanks Exploration Co. who acquired the dredge and additional ground the following year with plans to mine the remainder of the Mosquito Fork and all of Chicken Creek. Fairbanks Exploration Co (F.E.Co) continued their drilling program, which was initiated in 1939, and began designing an operation to be powered by local coal. A local power plant was planned, coal seams prospected, roads constructed and ground prepared until the beginning of World War 2 ceased all US mining operations. When F.E.Co resumed their operations following the war, their original plans were scrapped in favor of using one of their successful Fairbanks dredges to mine the Chicken placer deposit. 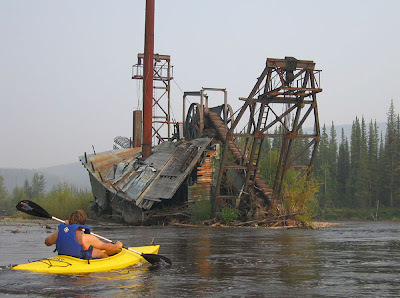 The Cowden dredge and its future were abandoned; it remains grounded and slowly deteriorating in the active riverbed of the Mosquito Fork. The old camp, consisting of a string of connected cabins, is also abandoned and deteriorating. The dredge can be viewed from a trail which leaves the Taylor Hwy at milepost 68.3 and both the dredge and camp can be accessed by water from Chicken.